Fred Woodcraft | Tommy's Footprints…..
September 1915 – Four drafts have already been sent from the Training Depot, numbering 356. The men at the Camp now total almost 1000. Recruits continue to come in and the men have been informed that to encourage personal recruiting the Duke of Bedford will give an extra fee for each fresh recruit procured. The open-air gymnasium has opened and more huts are being put up. Drafts 5, 6 and 7, totalling a further 200 men, are ready for despatch to the Front. On Thursday, September 2, Major-General E.F. Dixon paid an official inspection to the Ampthill training camp. The General first inspected the recruits’ musketry on the range and a party of men engaged in rapid firing from a trench. 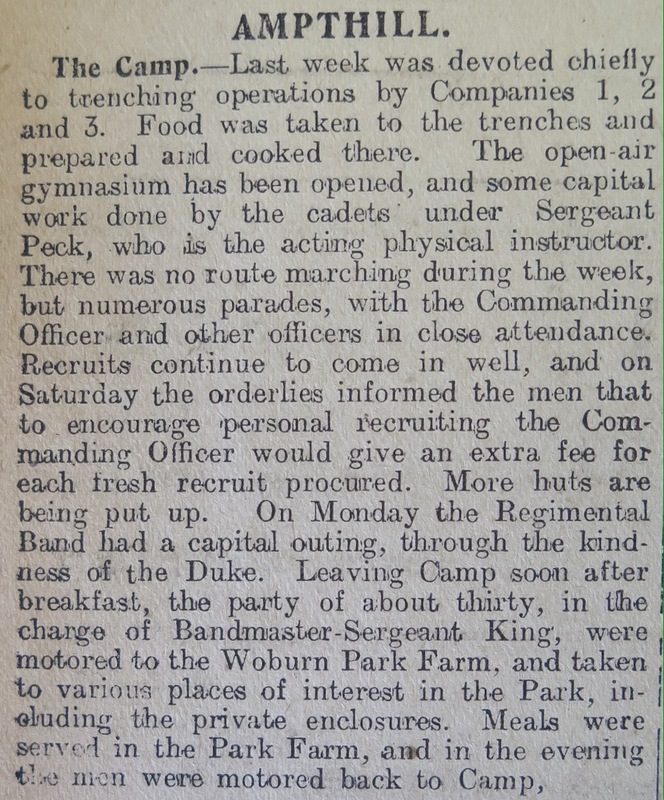 The inspecting officer then went to the trenching ground in Woburn Road. There General Dixon inspected the trenches and observed the relief carried out in a capital time of 35 minutes. Next he observed bomb fighting in the trenches, carried out in accordance to a scheme drawn up by Lieutenant Collisson. No.6 draft, under Major Young, was exercised in extended order and firing discipline, and also in close order formation. The General also went to see the signalling class, under Sergeant Freemantle, and rapid loading in a trench followed by a bayonet attack in the final assault. The Cadet Platoon came in for special notice by the General who witnessed the men tackle the obstacle course which has been newly installed to a plan sent from the Royal Engineers Office, Bedford. The General was delighted with all he saw and expressed his satisfaction to the Commanding Officer. A Colt machine gun and a dummy Maxim have been purchased. Future drafts going to the Front will include detachments trained in the use of these guns. His Grace has added a hut to the house in Dunstable Street, Ampthill that is rented for use as a V.A.D. Hospital. This new hospital enables men of the Depot to be medically treated without the usual deduction of 7d per dieum for hospital stoppages from their pay. On Tuesday, September 21, Captain the Hon. Moubray St.John kindly showed our reporter around the trenching ground and minutely explained their construction and uses – read more. The trenches are similar in all respects to the British and German trenches at Ypres. 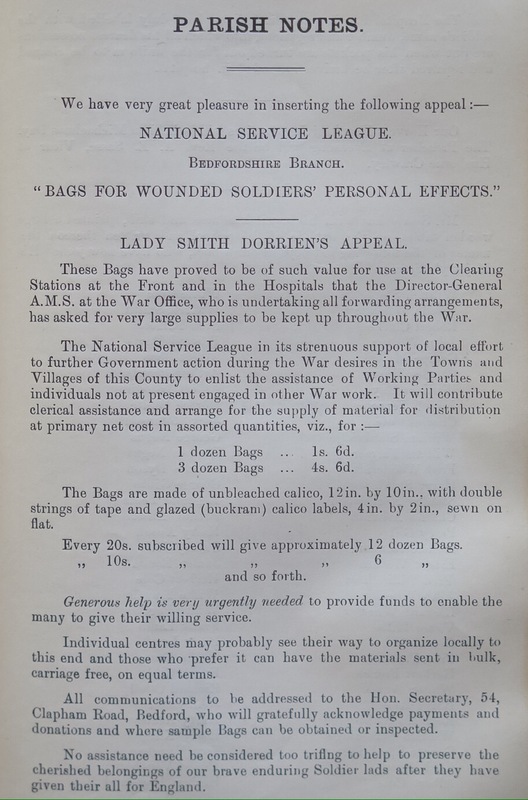 Lady Smith Dorrien has appealed for generous funds to enable the many of the National Service Leave to make Hospital Bags for wounded soldier’s personal effects. 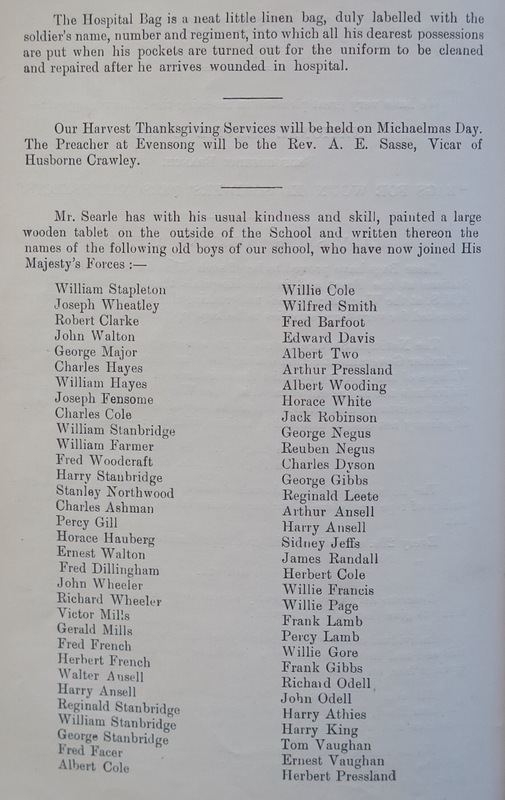 The Headmaster, Mr Searle, has painted a large wooden tablet on the outside of the National School in Bedford Road and written thereon the names of 64 old boys who have joined His Majesty’s Forces. A second tablet names a further 12 former members of the night school. What became of the men mentioned in the Bedfordshire Standard? Next installment to be published on 1 April 2016…. This entry was posted in Camp Diary, Uncategorized and tagged 1914-18, Albert Cole, Albert Two, Albert Wooding, Ampthill, Ampthill Park, Arthur Ansell, Arthur Pressland, Bedford Road, Bedfordshire Regiment, Bedfordshire Training Depot, Bedsathome, Bedsatwar, Camp Diary, Cecil Whiteman, Centenary, Charles Ashman, Charles Cole, Charles Dyson, Charles Hayes, Charles Weston, Collison, Edward Davis, Ernest Vaughan, Ernest Walton, Ernest Woodland, Frank Cox, Frank Gadsden, Frank Gibbs, Frank Lamb, Frank Shotbolt, Fred Barfoot, Fred Dillingham, Fred Facer, Fred French, Fred Woodcraft, General Dixon, George Gibbs, George Major, George Negus, George Quartermaine, George Stanbridge, Gerald Mills, Great War, Harry Ansell, Harry Athies, Harry King, Harry Stanbridge, Herbert Cole, Herbert French, Herbert Pressland, Horace Hauberg, Horace White, Jack Robinson, James Randall, John Odell, John Walton, John Wheeler, Joseph Fensoe, Joseph Wheatley, Major Stevens, Major Young, Moubray St.John, National School, Percy Gearey, Percy Gill, Percy Lamb, Percy Stanbridge, Pollard, Reginald Leete, Reginald Mobley, Reginald Shotbolt, Reginald Stanbridge, Reuben Negus, Rev WD May, Richard Odell, Richard Wheeler, Robert Clarke, Searle, Sergeant Blanksby, Sergeant Freemantle, Sergeant King, Sergeant Kitchener, Sergeant Parker, Sidney Jeffs, Stanley Northwood, Tom Vaughan, Trenching, VAD Hospital, Victor Mills, Walter Ansell, War Memorial, Wilfred Smith, William Dolton, William Farmer, William Hayes, William Stanbridge, William Stapleton, Willie Cole, Willie Francis, Willie Gore, Willie Page, Woburn Road, WWI on March 15, 2016 by Ste H.